Pretty frequently we are asked if or how you connect multiple clients to the same Mobile Service. The great thing about Mobile Services is that it’s meant to be the backend for your cross-platform apps. One app on several platforms with just a single Mobile Service backend. To facilitate demonstrating that fact, I’m going to review a sample I put out for iOS and Android a little while back: Feedback. The application allows your users to enter feedback (let’s say about the application) and then records it into Mobile Services. This is a really simple sample but demonstrates how we can use the same backend in both apps. You can access both the Android and iOS source code on GitHub. This sample is just done in Android and iOS right now. 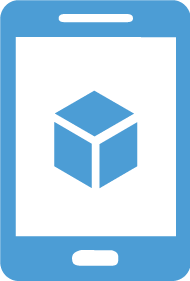 However, we could also connect a Windows Store or Windows Phone or HTML/JS app using their SDKs to the same service. In fact, using the REST API that is exposed by the Mobile Service, we could connect any application we want as long as it’s capable of doing an HTTP Post to our service. All of these clients and we can use the same single backend. Here you can copy your APPLICATION KEY which you’ll need in your client applications along with the name of your Mobile Service. Before we move on to the clients, go to the DATA tab (in the top of the portal) and click the CREATE button at the bottom. Name the table Feedback and leave the permissions as Anybody with the Application Key. Now before we run the application, let’s look at the code that will actually handle inserting the feedback to our Mobile Service. There are two real differences between these two method calls. The first is that the iOS version uses an NSDictionary which is essentially an array of key-value pairs. 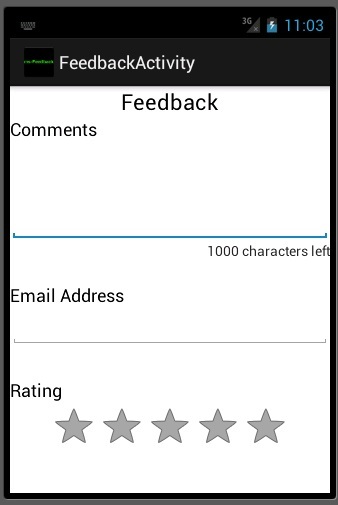 The Android version uses a strongly typed object named Feedback. Behind the scenes in the Mobile Services SDK, the same thing ends up happening: the data is serialized into JSON and sent up to the Mobile Service. The second difference is that the Android version just calls the callback sent into it where the iOS version attempts to log an error, if there was one, and then calls whatever completion handler was sent into it. 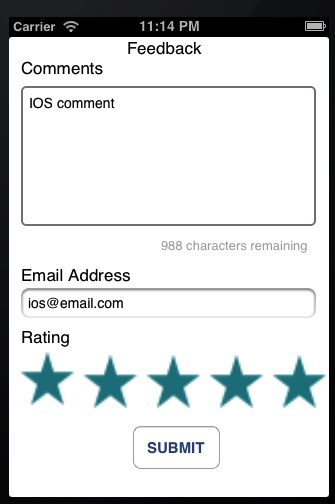 The Feedback portion of these apps were designed so that you could take the Feedback forms and drop them into your applications very easily. 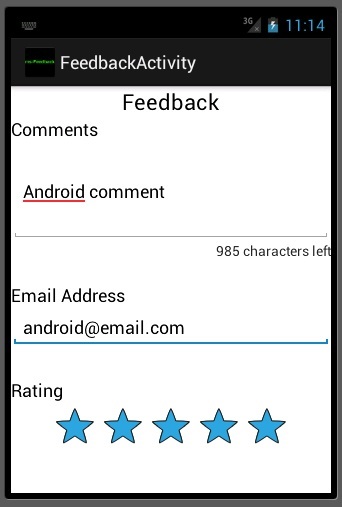 From the Android side, you just need to take the Feedback, FeedbackActivity, FeedbackService classes and activity_feedback layout and drop them into your application. 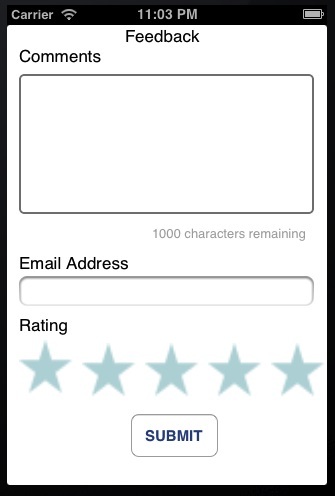 Once you’ve configured FeedbackService to use your Mobile Service URL and key, you just need to launch the FeedbackActivity and it will record your feedback (you’ll also need to make sure FeedbackActivity is in your manifest). 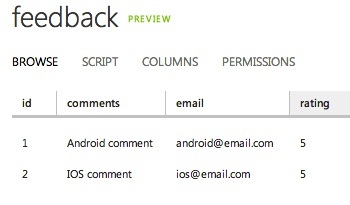 For iOS, there is a MSFeedback file group that you can copy over to your project. The UI for the feedback form is put into xib files, so even if you’re using storyboards, you can easily drop the feedback stuff into your own application. Today we saw how easy it is to use the same Mobile Service as a backend for apps running on different platforms. In this case it was iOS and Android, however, you could continue to connect other clients to this Mobile Service or choose a different mix of clients if you wanted. With Mobile Service’s official support for Android, iOS, HTML/JS, Windows Phone, and Windows Store apps, you’re easily able to use the same Mobile Service as a backend for most different app platforms. Finally, we saw how easy it is to use Mobile Services to gather feedback on your application even if this is the only way you’re using Mobile Services.